The pickups are the heart of an electric guitar. People debate about how the sound is affected by string gauge, bridge, body woods, necks, fretboards, even finishes. There's probably someone prepared to tell you inlays make a difference. But no-one questions the pick-ups' contribution. All the other factors change the sound in different (sometimes imaginary) ways, but it's the pickups that pump it out. Fortunately changing them is much easier than a heart transplant. The Yamaha Pacifica 112 is a solid entry-level electric: an easy neck to play, a stratocaster-like three pickups configuration which gives a range of sounds and solidly constructed. A humbucking bridge pickup provides a bit of extra firepower for heavier rock and blues sounds. When Yamaha updated the guitar around 2010 they added a few things, including making it even more versatile by adding a coil-tap to the bridge pickup (switch between single coil and humbucker). Mine was made before this upgrade, which led to the opportunity for some DIY. Changing pickups is not very difficult, but I'm writing about it because there are some things, especially if doing it for the first time, which aren't really mentioned out there on the web. Of course you might know all this already and just skip straight to the pictures. The very basic overview on guitar pickups: it's a coil of wire around a magnet. The vibration of the string above it changes the magnetic field in the coil and induces a voltage in the coil (thank you Michael Faraday). This coil of wire obviously has two ends, there is also an earth wire that connects to the metal body of the pickup and shields the cable from interference. That's a total of three wires. In stock pickups the earth is often connected to one of the coil wires, bringing it back down to two. A humbucker is made of two pickups in one package, how many wires does it have? Somewhere between two and four plus earth (you might call that five...). A steel screwdriver (not a magnetised one), or spanner, or piece of cutlery, or small decorative figurine. Steel is the thing, aluminium can't help us here. A multimeter, analogue is good, but digital will do. Gently touch the screwdriver onto the pickup pole pieces. If you really are using an oddly shaped implement use a blunt area. Connect the multimeter to the coil wires and set it to DC voltage, order of 20mV (millivolts) scale. Quickly lift the screwdriver off the pickup, while watching the multimeter and without stabbing anyone (or yourself). If the multimeter goes positive when you lift the screwdriver off then the positive multimeter probe is connected to what we'll call the + wire of the coil (this is easier to see on an analogue meter). If it goes negative then the negative probe is connected to the + wire. Calling it the + wire doesn't necessarily agree with what anyone else will call it, just make a note of which one it is. You can do the same thing to your guitar without opening it up, just plug in a cable and connect the multimeter to the other end. The tip is 'hot' and the sleeve is 'earth', either one could be the '+' end (e.g. supposedly Fender and Gibson are the opposite way around). Check the reading changes if you swap the probes round—if your multimeter is in AC mode it'll tell you + either way. They are pushing in the same direction. That's the '+' thing above. Some people do actually like the sound of having them push the opposite direction (they don't entirely cancel), but it's much thinner (sometimes called 'nasal'). Noise cancellation (for single coils). Which end is '+' depends on the direction of the magnet (or pencil) and the direction of winding. But for background noise (e.g. mains hum) only the direction of winding matters. So if you have two pickups with magnets the opposite way up and you join their '+' together (in parallel), they will have opposite noise and it largely cancels. 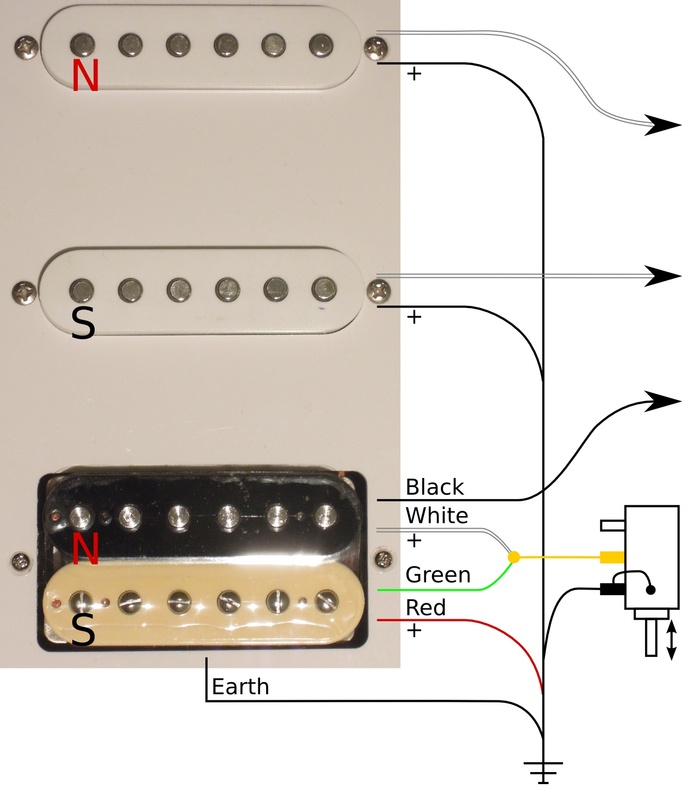 This is how a humbucker works. You might see the term 'RWRP', which means reverse wound reverse polarity and is often used for strat mid pickups to get that effect. However 'RW' really just comes down to what way round you connect the wires: what you're really looking for is the magnets the other way round. Easy way to tell? If the pickups push apart when head-to-head they have the same magnetic polarity, if they attract they're opposite. For a set of strat single-coil pickups the middle one should attract the other when two head-to-head. (Don't try and force them together if they push apart, they don't like it). All this is great, but if your new pickup doesn't have a separate earth wire you have to choose between having it the right way round to match the other pickups in your guitar and having it the right way round to earth properly. Fortunately after-market pickups should normally have a separate earth. If you're adding a new pick-up regard 'hot' for the pickup as whatever end matches 'hot' for the guitar and the earth connections for the stock pickups will already be okay. If your pickup doesn't have opposite magnetic polarity to the ones it will combine with then it's probably better to make sure the '+' match. Unless you really do want that nasal sound or to play very high gain with mixed positions. Putting it into practice. We have one Yamaha Pacifica pre-2010. To add a coil split switch it's necessary to get a new bridge humbucker, because the existing one has only two wires and a coil split needs access to the connection between the two halves. You can spend a lot on pickups and I didn't really want to spend more than the re-sale value of the guitar. You can also spend very little and get rubbish, which wouldn't have been much of an upgrade. After a bit of searching around I found IronGear who are a British brand making affordable pickups overseas and getting very good reviews for them. Their Hot Slag is a bit higher output than the pickup it's replacing, but the idea is that in single-coil mode it should pair up with the Pacifica's middle pickup, which is fairly high impedance too. The Rolling Mill is more vintage-voiced and classic rock than the hot slag which heads off into hard rock and metal territory. The Steam Hammer heads off even further down that road, but the hot slag seemed the one to go for. The pickups and other bits and pieces that were needed (practical: a new volume control with a switch, extra wire, new control knobs; decorative: some new black trim) were all bought from Axetec who were very easy to deal with (IronGear is their brand). I've been telling this story backwards so far, I knew I needed a new pickup because I opened the guitar up first, I know about checking the '+' rather than relying on manufacturer's 'hot' label because I started by wiring things up the wrong way around. From here on the story goes forwards. Here's the inside of the pre-2010 Pacifica. All the stock pickups are 12kΩ (most after-market ones have different bridge, middle and neck variants), all have only two wires. The voltage pot is 500kΩ log (what you might expect for the humbucker in the bridge) and the tone pot is 250kΩ with a 22μF capacitor. The routing for the pickups is a 'bath-tub' type and the routing for circuitry is fairly (39mm) deep. leads going to the selector switch. My main aim here is to add the coil tap switch. Like the new model Pacifica this is going to be a push-pull switch on the volume knob. That means a new volume pot and some grippier knobs (LP-style speed knobs). The switch is wired so when it's pulled out it shorts out one of the humbucker coils. Which one? This is the reason for my earlier rambling: I want the remaining coil to have the opposite polarity to the existing middle pickup. For me that means the black side of the zebra pickup and the black-white pair of wires. The final wiring is on the right. 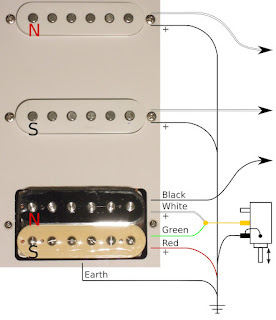 The Hot Slag is connected backwards compared to IronGear's suggestion, because the other pickups are that way round, the split-coil switch shorts the green to red turning off the 'S' pickup coil, leaving the 'N' one. If I'd wanted the single coil the closest one to the bridge the thing to do would be turn the pickup around. Pacifica scratchplate with the IronGear fitted. is wired the wrong way around at this point. To use a push-pull switch you have to be able to pull it, so a new volume knob with good grip is needed. One symptom of the Hot Slag's heavier rock leaning is that it doesn't come with white bobbins. Well, the whole lot may as well match, so it's time to make some decorative changes. Fortunately single-coil covers can be changed easily (and fortunately someone pointed this out to me). The last thing to do is set the pickup height, see Alan Ratcliffe's article or Nils on guitar setup. I wont claim to be expert at reviewing pickups, but the Hot Slag sounds good. It's a bit higher output than the standard one, but splitting it dials it back and gives a brighter sound which will also mix nicely with the middle pickup. The only downside is that now I want to try changing all the others. Sound clips to follow, maybe?